I'm incorporating more and more oils into my beauty regimen because of their effectiveness. 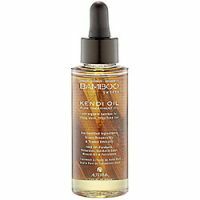 A friend of mine has been complaining that her hair is completely "fried," and so when we were out shopping together we each bought a bottle of Alterna's "Bamboo Smooth Kendi Oil Pure Treatment Oil." It is formulated without sulfates, phthalates, GMO's, Triclosan, and synthetic dyes. The scent is fabulou...read mores but subtle. The ingredients include Organic Bamboo Extract, which immediately boosts hair's strength and flexibility. Organic Kendi Oil maintains the hair's lipid layer and protects it from future damage by infusing it with the antioxidant Tocopherol and multiple fatty acids (3, 6, and 9). It sounds like it would be thick and weigh hair down, but I would recommend this for even the most fine, thin hair. This is a truly lightweight oil which repairs spit ends and deeply hydrates. A vivid shine is restored with this oil. It also contains a Color Hold® complex which extends the life of your color. Wow--we are both highly impressed! This is my new favorite hair savior. I've used Moroccan Oil for years, and loved how it made my hair feel though it was always a tad on the heavy side. This kendi oil is really lightweight. It does everything Moroccan Oil does, but without adding any weight to my fine hair. My hair stays soft, no strays or flyaways, and has a little extra oomph, even now as we get into the hot and humid summer months. It also smells wonderful and also works as a great non-greasy hand softener in a pinch! Use this on my fresh damp towel dried highlighted hair, sometimes I then blowdry and sometimes just leave it to air-dry. WIth both options hair is left amazing. GIves nice color to my highlights, makes my hair extremely soft and natural. I simply love the effect this gives to my hair. DOn't think it would work well for fine thin hair though. SMells great too, like an expensive perfume.